Ray Gipson’s Where’s My Boozer Gone? 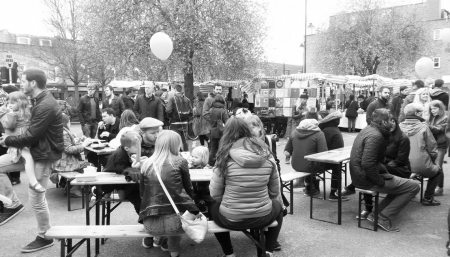 tour of the Roman Road and beyond, telling stories about the pubs that used to be on every corner, was one of the successful events of a very successful launch of the Roman Road Yard Market a couple of Saturdays ago. There was a tremendous turnout for the launch. Click here to read the report, look at the photos and watch the video. 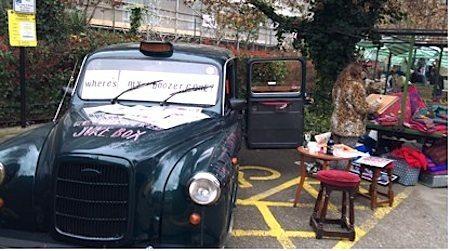 On the day Artist Lucy Schofield turned up with her taxi adapted into a mini-pub for WMBG? 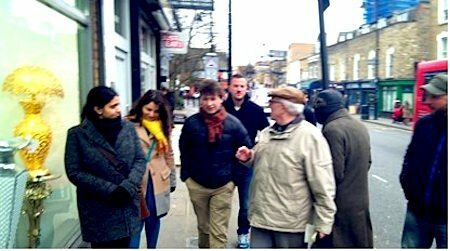 events and at 4 o’clock Ray took off with 12 people on the tour – a trip down memory lane along the Roman Road. He told of a time when the the pubs were social centres for the community – sources of support, entertainment, gossip and community organisation. Ray himself ran a football team for many years out of the Hand and Flower on Parnell Road at the end of the Roman. Its now a Turkish restaurant. We’ve got a couple of clips of Ray talking about pub life. 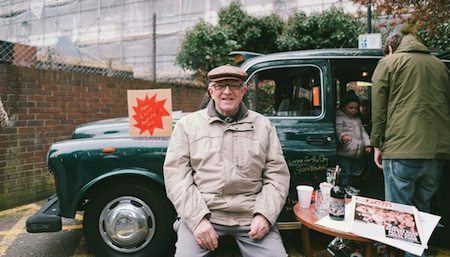 In the first he talks about pigeon racing in the Nelson in Hackney Wick . This comes from the popular Geezers film The Geezers on Tour in Hackney Wick. In the next clip he reminisces about playing shove halfpenny in the Three Tuns Pub in Bow Road.